It took a wonder strike from Kirk Millar to secure the opening points of the season against Ballinamallard this afternoon. Kirk’s quick thinking first time effort from near the half way line gave Linfield the win, after keeper James McGrath’s long clearance fell perfectly for him. But the Blues had to work hard to secure the victory. They opened the scoring after just eight minutes Stephen Lowry headed across goal from the back post and into the net. But the Ferney Park levelled on 28 minutes when debut boy Ryan McConnell brilliantly found the bottom corner with an over-head effort which beat keeper Roy Carroll. It was that goal though from Millar that sealed the points. McGrath had come off his line to clear wide in the penalty box, but the effort only fell for Millar near the sideline and the halfway line to pump it straight back and with keeper McGrath stranded the ball fell beautifully into the empty net. Linfield manager David Healty said it was always about the result. 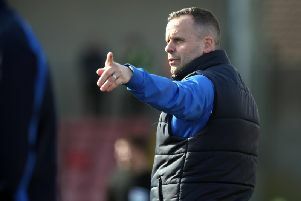 Ballinamallard manager Gavin Dyles was disappointed that his side didn’t get anything out of the game.